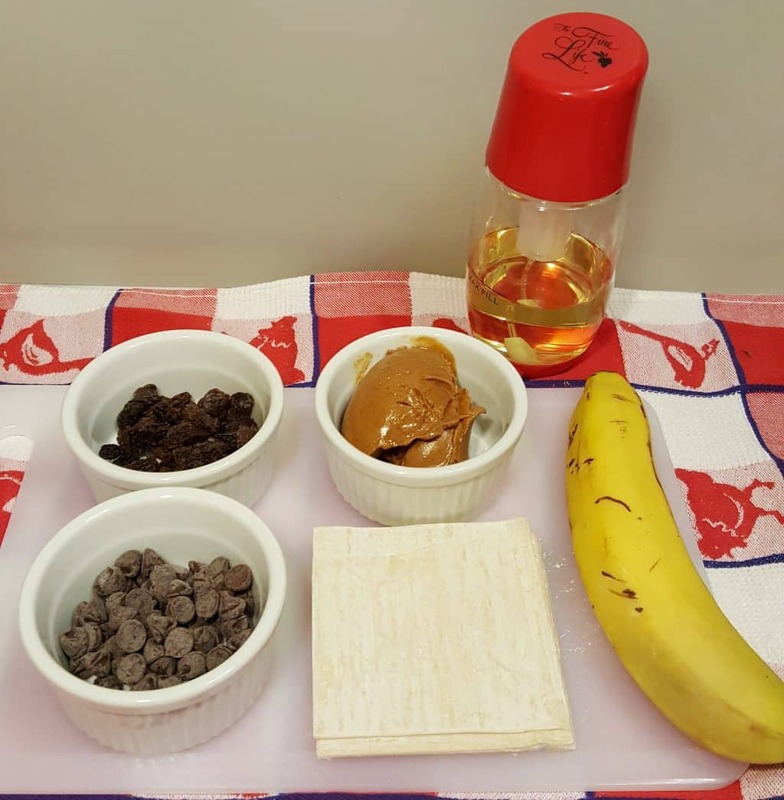 Air Fryer Peanut Butter Banana Dessert Bites are an easy and quick treat, suitable for Elvis. 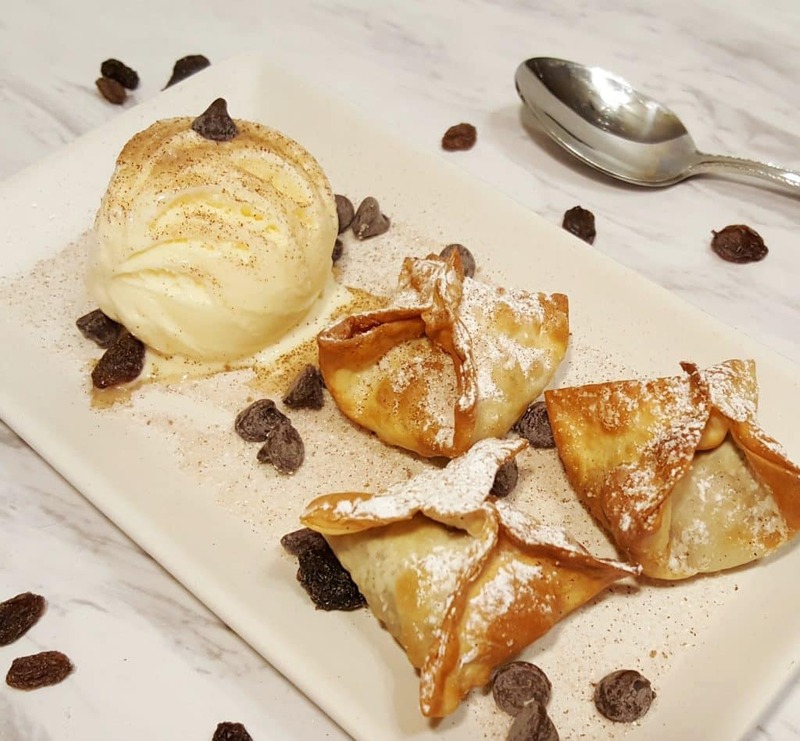 Serve with a scoop of Vanilla Ice Cream. 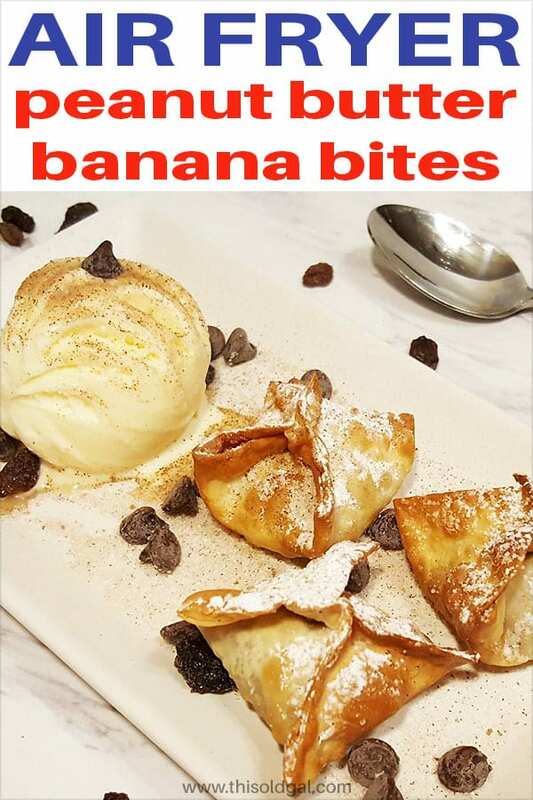 These Air Fryer Peanut Butter Banana Dessert Bites are like little packages of sweet and creamy pillows, in a crackling shell. They are easy to make and cook up quickly. If you have unexpected company, prepare some tea and sit down to a cup of tea and a treat or two, or three…. Berries, apples, peaches, all will go well in this recipe, so if you are out of Bananas, no worries. Try White Chocolate Chips, Raspberries and Peanut Butter. OMG, that is a delicious combination. Chunky Peanut Butter would be great in this recipe too. You can always buy fresh Peanuts and make your own Peanut Butter in the VitaMix Blender. It only takes a few minutes and you have the most delicious Homemade Peanut Butter. Sometimes I add a touch of honey and sometimes I add raisins and cinnamon. If you are slow like me, add some lemon to water and pour over the Bananas, so they won’t brown. Apples brown faster than Bananas. 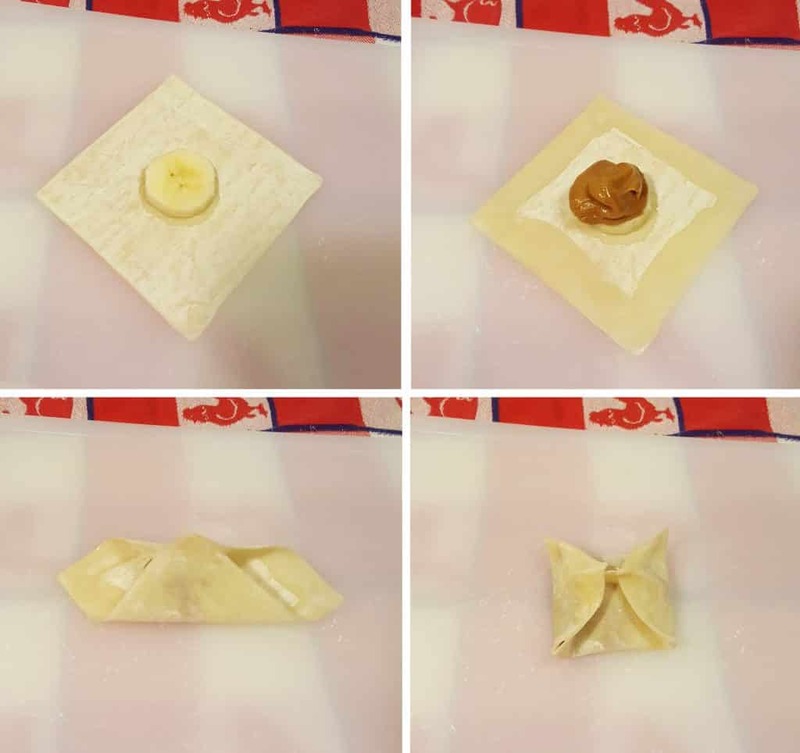 Brushing a little water or Egg White around the Won Ton Wrapper, will keep the Air Fryer Peanut Butter Banana Bites nicely sealed and prevent leakage. Squish opposite sides together and squeeze to stick. Bring up the other two sides, to make a nice little package. Make sure the Bites are completely sealed. You don’t want anything to leak out and burn and make a mess. Another yummy Banana recipe to try are my Air Fryer Cuban Platanos. Top left is Banana, Peanut Butter and Chocolate Chips. Top right is Banana, Peanut Butter and Raisins. Bottom left is Banana, Peanut Butter, Raisins and Cinnamon. Bottom left is Banana, Peanut Butter, Raisins, Chocolate Chips and Cinnamon. The flavor options are endless. Try a piece of Caramel and a piece of Apple for Halloween! Add some Craisins and call it a Christmas Dessert! 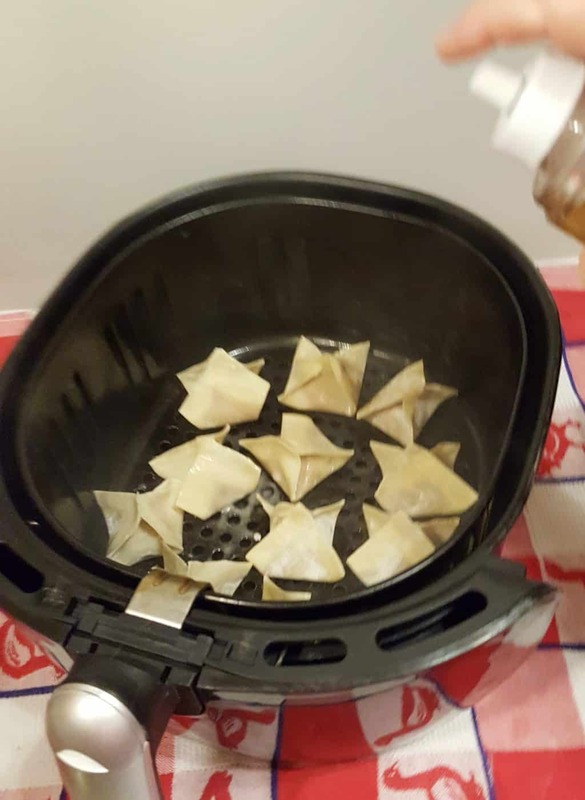 Check out my How to Season Air Fryer Basket post, so that the won ton wrappers won’t stick to the Air Fryer Basket. Use an Oil Spritzer and Spray each Bite generously. Sprinkle with Air Fryer Peanut Butter Bites with Powdered Sugar and/or Cinnamon Sugar. Serve with a scoop of Vanilla Ice Cream, if you like. It’s an easy dessert, that will impress your company…and your kids! For another delicious dessert, try my Chocolate Chip Bread Pudding. 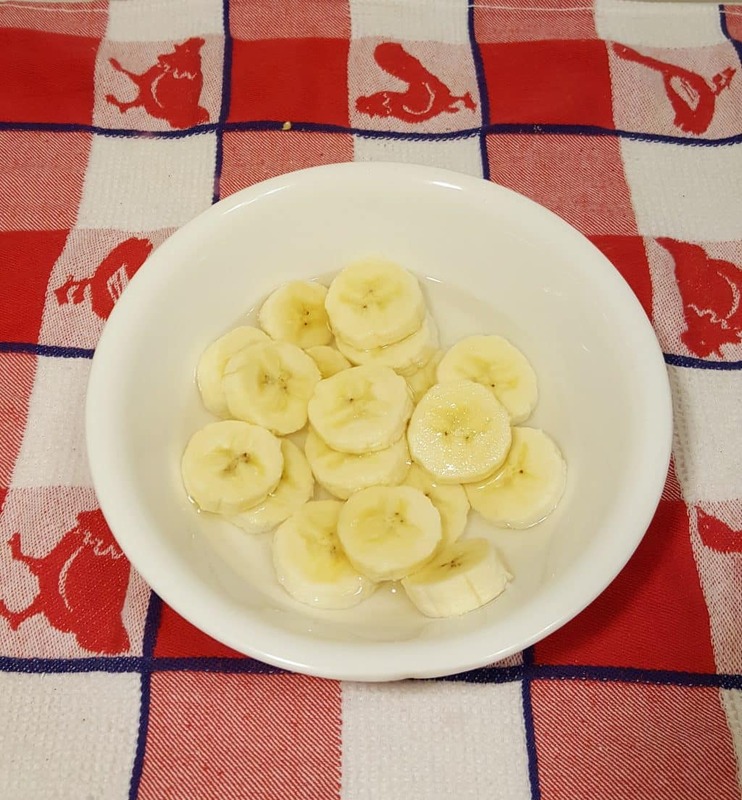 Slice Banana and place in a Bowl of Water, with a splash of Lemon (to keep from browning). 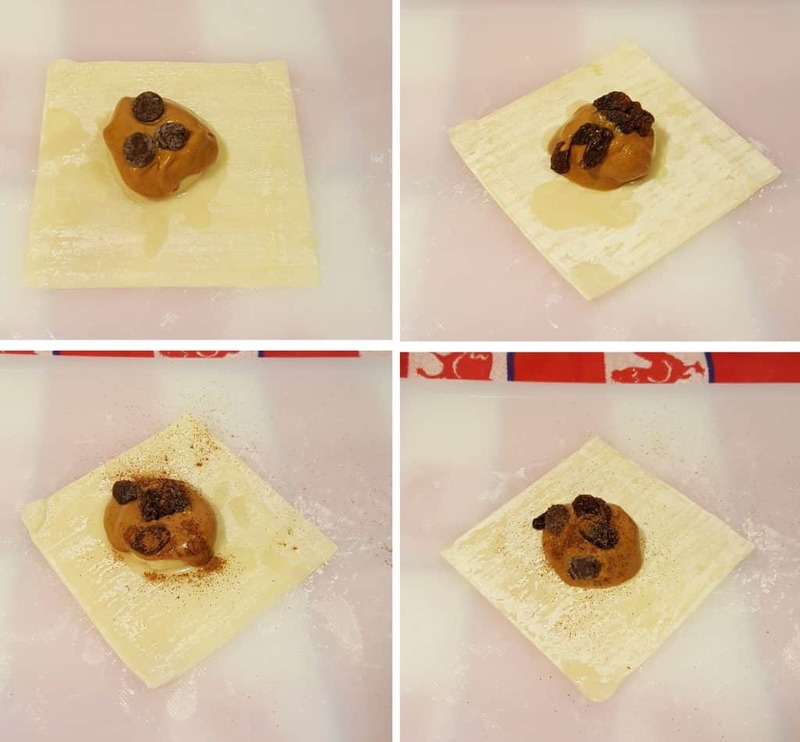 Place one Banana Slice and 1 teaspoon of Peanut Butter in middle of Won Ton Wrapper. Brush Water along edges of Won Ton Wrapper. Bring together opposite corners and squeeze. Fold up remaining opposite sides and squeeze. Place into Properly Prepared Air Fryer Basket. Spray generously with Oil. Cook for 6 minutes at 380 degrees. 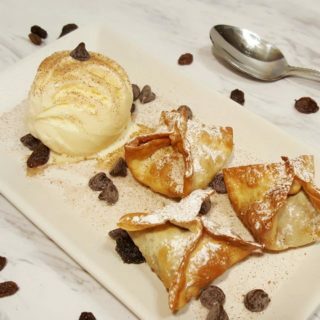 Serve with a scoop of Vanilla Ice Cream and a dusting of Cinnamon and Sugar. 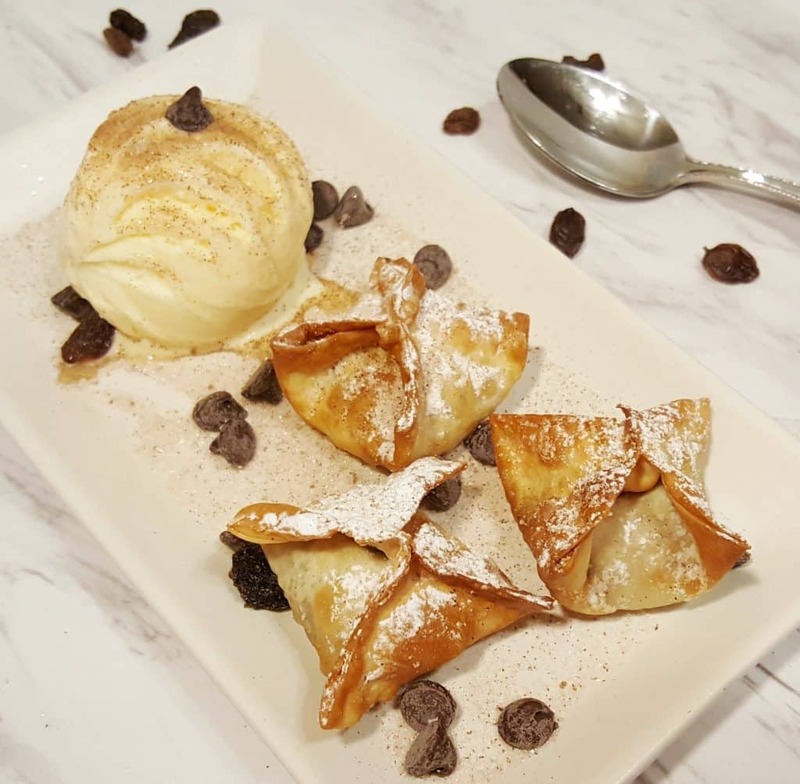 PIN this Air Fryer Peanut Butter Banana Dessert Bites recipe! My entire family really appreciates our IP although they were extremely skeptical when I first purchased it after reading your postings. Even my son is now involved with meal prep. He nowconsiders himself an expert on cooking IP rice and IP quinoa casseroles. Now I am seriously considering an Air Fryer, but have some questions. 1. The capacity looks so small – are there racks that can be used to increase the volume? 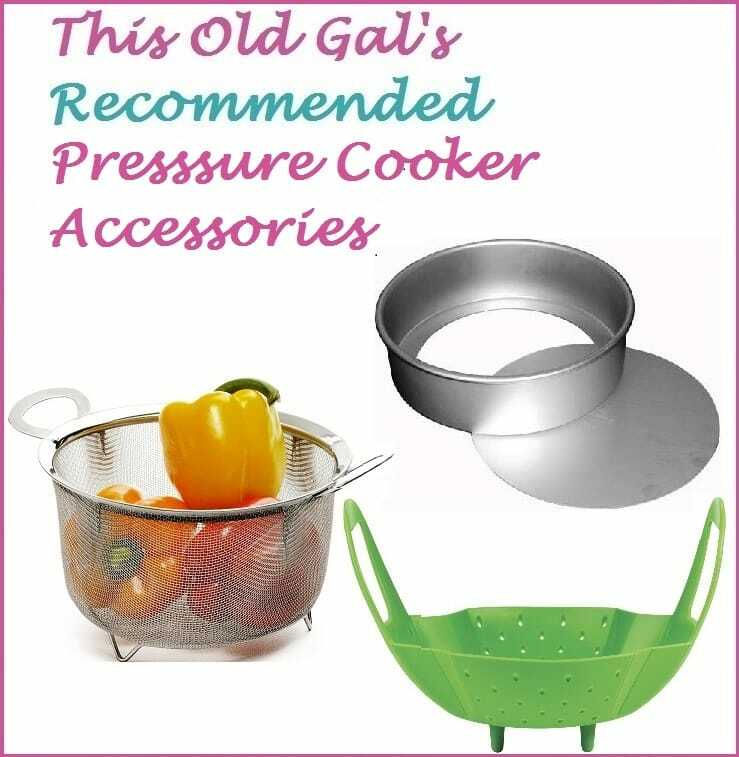 Thanks for posting your recipes and “how to” articles. I have found so many useful accessories for the IP through your column. can these be made ahead a little bit, and put in the air fryer later?